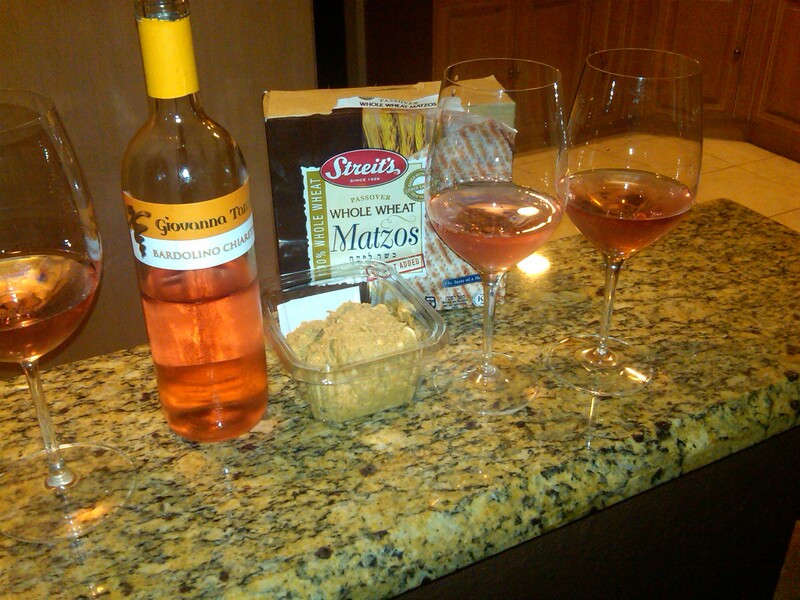 Italian Varietals With Passover Food? What Am I Chopped Liver? I always encourage wine consumers to stray away from the standard grape varietals and countries they keep buying wine from repeatedly. The fun of wine is to branch out and experiment. I practice what I preach. My work schedule is crazy, so this year I didn’t get to have my once a year fill of Passover Foods that remind me of my childhood. My friend Carolina who is originally from Argentina, whipped up a bowl of Homemade Matzoh Ball Soup better than I’ve had in 30 years when my grandmother was alive. I took care of the Brisket of Beef and I cheated a little and picked up some store-bought chopped liver with Whole Wheat Matzohs (At least one part of this meal had some fiber). Now the Wine Pairing Decision. With the first course of Chopped Liver and Matzoh Ball Soup, I went with an Italian Rose made by Bardolino winery owner and winemaker Giovanna Tantini. I think Italian Roses are more food friendly than the drier styles from Provence or Bandol in Southern France. They seem to pair well with just about anything. On to the Main Course. My Grandmother’s recipe for Brisket of Beef that braises for 3 hours until fork tender in beef broth and red wine, with the usual trilogy of Carrots, Onions, Celery. We had a great side of Roasted Beets, Yams and Potatoes. Time to test out a California Wine. Nope, not a Cabernet Sauvignon or Merlot or Syrah. 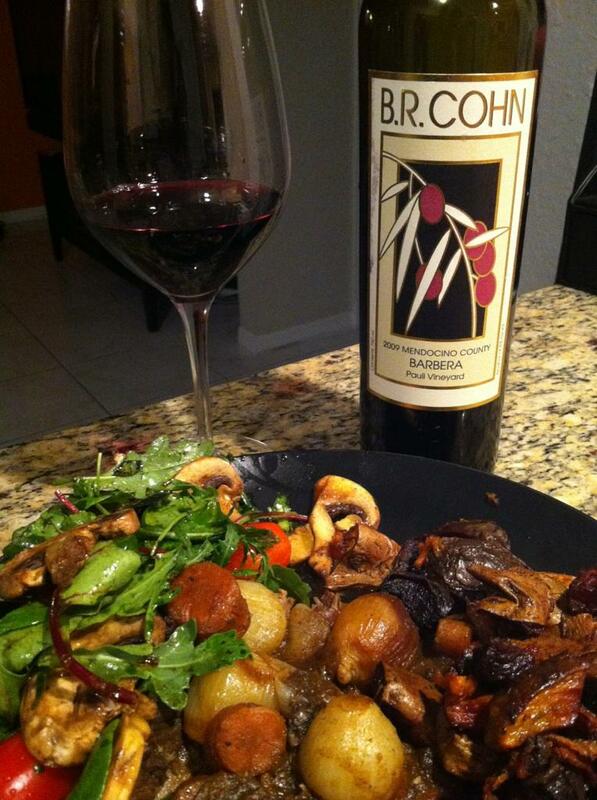 B.R Cohn released for the first time 700 cases of a 2009 Barbera that comes from Bill Pauli’s Vineyard in the hills just north of Ukiah in Mendocino County. Here, the warm days and cool nights provide the perfect climate for this grape. In case you think you read this wrong, I only had one glass of Bardolino before writing this blog so I am sober. Yes, the famous grape varietal Barbera coming from the Piemonte region of Italy in either Asti or Alba was grown in Mendocino County California!. The wine was tight and had a little too much alcohol at first hitting the heat index at 14.8% but after about 2 solid hours this Barbera was pretty. Silky flavors of spicy plums, cherry and a hint of pomegranate was a palate cleansing match for the rich brisket and gravy. The medium charred French Oak was not overbearing and actually added a nice toasty finish to this Italian Varietal made in California. It was even good to the last drop with a couple of bites of dark chocolate. I think the lesson I learned from this odd pairing of wine and food was something I already knew. It’s kind of like the Six Degrees of Kevin Bacon (Did I just say Bacon on Passover..OOPS!) I love the great wines of France, Spain, Portugal, Washington State, Oregon, California, New York State, but as an overview of what wines are the “Go To” Wines to serve with dinner that won’t break your piggy bank, Italian Varietals from first course to dessert, seem to be the food friendliest of all, even when the Barbera is coming from California. I bet you if I would have done a full blown Seder and Left out a glass for Elijah of either one of these two great wines, he never would have made it to anyone else’s Passover Meal. Ciao and L’Chiam! NextWith Wine “Screw Off” Is A Good Thing!